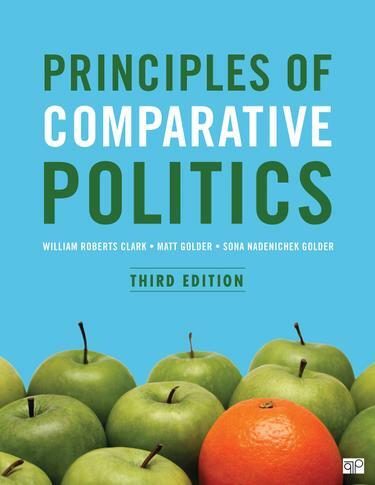 William Roberts Clark, Matt Golder, and Sona Nadenichek Golder’s groundbreaking Principles of Comparative Politics offers the most comprehensive and up-to-date introduction to comparative inquiry, research, and scholarship. In this thoroughly revised Third Edition, readers have an even better guide to cross-national comparison and why it matters. Readers are offered a new intuitive take on statistical analyses and a clearer explanation of how to interpret regression results; a thoroughly-revised chapter on culture and democracy that now includes a more extensive discussion of cultural modernization theory and a new overview of survey methods for addressing sensitive topics; and a revised chapter on dictatorships that incorporates a principal-agent framework for understanding authoritarian institutions. Examples from the gender and politics literature have been incorporated into various chapters and empirical examples and data on various types of institutions have been updated. The book's outstanding pedagogy includes more than 250 tables and figures, numerous photos and maps, end of chapter exercises and problem sets, and a broader set of works cited. A new intuitive take on statistical analyses and a clearer explanation of how to interpret regression results are included. A thoroughly-revised chapter on culture and democracy includes a more extensive discussion of cultural modernization theory and a new overview of survey methods for addressing sensitive topics. A revised chapter on dictatorships incorporates a principal-agent framework for understanding authoritarian institutions. Examples from the gender and politics literature have been incorporated into various chapters. Empirical examples and data on various types of institutions have been updated. Online videos and tutorials guide students through some of the methodological components addressed in the book.